ViArchive Server provides indexing, streaming and transcoding to your video archives. ViArchive Server can be used both as a standalone video archive with ViArchive XPRESS as clients, or serve as video handler for image archives where ViArchive plugin is implemented. 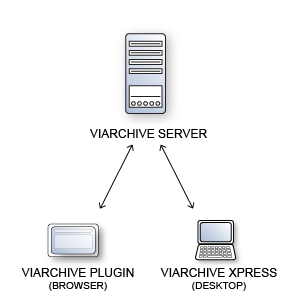 Multiple archives can be catered for by ViArchive server. Because ViArchive Server creates streamable copies of original files, it is fast to view video clips and jump around on the timeline of clips. It saves time and network speed! 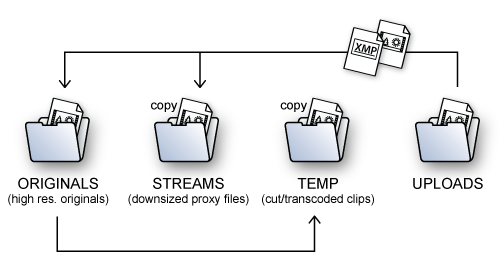 The scripting of the metadata is carried out by a standardized xmp-sidecar. In addition to standard xmp-metadata ViArchive namespaces enables scripting of the time line. This allows for example navigation on the time line of video clips by attached keywords or import/export metadata from video editing tools like Adobe Premiere. Metatags are easily added and with an included indexing engine video clips are fast to search. In ViArchive you can add metatags on durations as well as on single frames. On upload the system automatically creates one or more downsized streamable proxy files identical to the original, which provides fast access and reduces network traffic. The great advantage of this is that it enables fast access to the video also when for example jumping around on the time line or viewing the video at different speeds to get a quick overview. The original high quality file is however also stored on the server. Although the video clips are streamed from proxy files, the transcoding to the requested output format is always done from the original uploaded high quality file on the server. No quality is thus lost in the process before transcoding to the desired export format. ViArchive Server includes ViArchive Manager, an administration console for adjusting all server settings and preferences. The system administrator can here control i.e. multiple archives, union archives, the transcoding of uploaded files to streams (multiple proxies are possible), administrating user profiles, change a clip’s preview image, adjust plugin settins and view logs, tasks & services.